Travel calls for some crucial items to go in your carry-on or suitcase. But what about those non-essentials? Some items, although we admit aren’t completely necessary, will make sure your journey runs even smoother – and we all know a pleasant ride is likely to improve the quality of your holiday overall. So, without further ado, here are six of the best travel gadgets that you didn’t even know you needed… until now, that is. Forever losing the keys to your padlock? Or forgetting the combination? Now you don’t have to worry about that either – coming in August 2016, the Kickstarter-backed AirBolt is a padlock that you can open using the power of your phone. Well, your phone’s Bluetooth anyway. We know what you’re thinking: what if you run out of battery? Or worse, what if you lose your phone? Never fear, AirBolt can still be unlocked from someone else’s phone, all you need do is download the app and input your login. And if all else fails, there’s a button combination as a back-up. Speaking of keeping your phone juiced up, that needn’t be a worry either. Portable chargers are ten a penny these days, and most allow you to charge your phone, tablet or e-reader. We love the TravelCard in particular – it powers up Apple and Android devices and it’s so small (as the name suggests, it’s of credit card-size) that you can fit it inside your wallet or purse. An oldie but a goodie – the headphone splitter is ideal for families and couples wanting to watch the same in-flight entertainment, or listen to the latest music together. Taking the standard splitter up a notch is the Belkin RockStar range. Its starfish shape boasts five headphone ports, meaning you, your partner, your kids and even grandma can tune in. Cabin baggage, handbag, laptop, duty-free bargains, your lunch/dinner… Make juggling all your travel stuff at the airport that bit easier with the Tugo luggage drink holder. 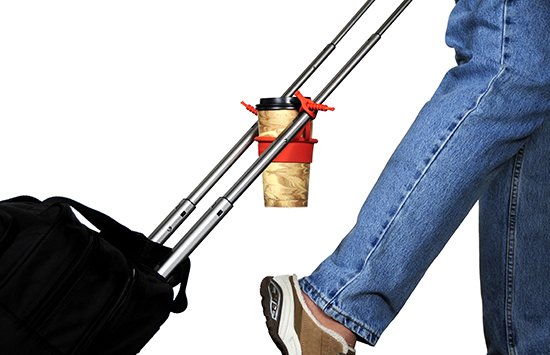 This nifty device attaches to the handles of your suitcase to create a manoeuvrable yet secure vessel for your tea, coffee or bottle of fizz or water. It may seem like a small, perhaps unnecessary addition to your carry-on, but if it means not spilling a hot beverage all over yourself, we’re sold. After five hours of watching back-to-back episodes of Friends or catching the latest movies on your long-haul flight, it’s probably a good time to think about catching a few Zs. But, if you’re anything like this writer, that’s easier said than done. As far as I’m concerned, you have to be a contortionist to get into a comfortable position to sleep when flying. That, or you need to be able to afford a lie-flat bed in First Class, which, let’s face it, just isn’t achievable for the average joe. The NapAnywhere travel pillow seeks to change all that though. This supportive piece of padded foam moulds to the shape of your neck and shoulders and is designed to cradle your head and chin. It not only aids peaceful sleep in the air, but should prevent any stiff muscles resulting from sleeping in an awkward position too. Document your globetrotting on the go: this miniature version of the popular, full-size Scratch Map means you can scratch off segments of gold leaf as you spend three weeks traversing Southeast Asia or discovering Australia. It’s compact enough that you can store it in your luggage with ease. On the reverse side of your scratch map there’s also a blank map, allowing you to plot your route, plan your next trip and stick notes and travel tips on it.